Have You Heard? eESI’s HR issues for small businesses podcast series is a summer hit - eEmployers Solutions, Inc. This summer has been a busy one here at eESI. We’ve been busy supporting our partners with employee training, payroll services, benefits administration and more. Plus, to keep you up to date and in the loop, we added several new episodes to our podcast series on HR issues for small businesses. Have you heard it yet? If you missed our latest podcasts, now’s your chance to catch up. Here’s a summary of our most recent episodes. 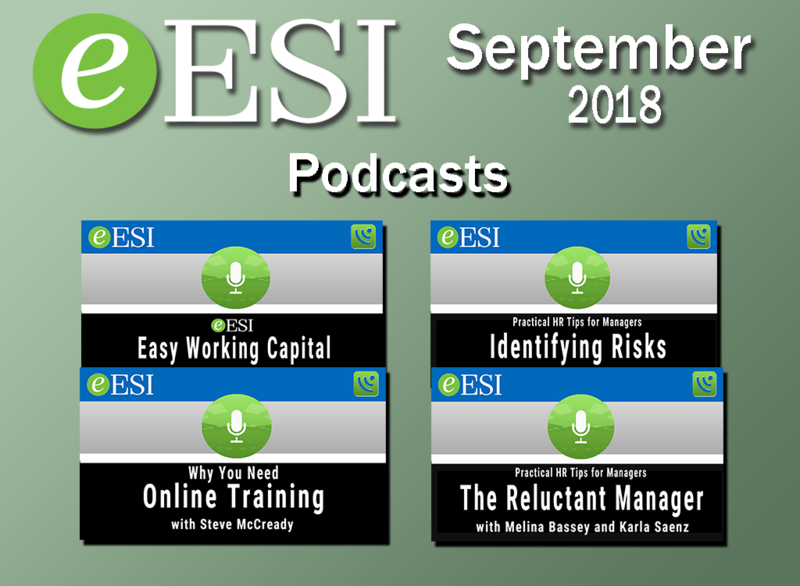 Why You Need Online Training—In this episode, we spoke with BLR’s Steve McCready to learn more about BLR’s online and in-person training and compliance solutions. BLR is an eESI business partner meaning their comprehensive training solutions are available to every eESI client. Learn more about what McCready had to say and download eESI’s free Company Training Guide here. Easy Working Capital-–Managing cash flow is often a challenge for small to medium businesses. That’s why eESI partnered with Payroll Funding Company. In this podcast episode, Payroll Funding Company’s Steve Ott explains the benefits of using his company’s short-term credit instead of relying on other funding solutions. You can find out more about this podcast in our article, eESI’s Easy Working Capital–A New Small Business Funding Solution. Identifying Risks—As part of our ongoing series, Practical HR Tips for Managers, we spoke with Melina Bassey. Bassey told us that business should continually educate their teams to ensure proper risk identification. She also reminded us that nurturing a compliance culture starts at the top. Check the article plus podcast combo here. The Reluctant Manager-–In this episode of the Practical HR Tips for Managers series, Melina Bassey and Karla Saenz share tips for handling common HR issues. Managers are often the first to hear about a problem and need adequate training to ensure those problems are handled properly. Find out what you can do to support your management team and download eESI’s free Anti-Discrimination checklist for managers here. Austin’s Paid Sick Leave Ordinance—Texas business owners, is a paid sick leave requirement coming to a municipality near you? Austin and San Antonio have both passed ordinances requiring certain employers to provide paid sick leave to covered employees. Will the laws stick? We spoke with Shelia Price to find out more in a recent podcast episode. Check out the podcast and our notes, plus download a free overview of Austin’s paid sick leave ordinance here. The above list highlights some of eESI’s most recent podcasts, but there are more. You’ll find our full collection of podcasts on the eESI website Videos and Podcasts page. And, if you have a question you’d like to hear answered on an upcoming podcast, get in touch. We’d love the opportunity to address your HR questions.